Teaching children about the environment and ecosystems in Australia, and about the wildlife that depends on these, has never been more important than it is today. 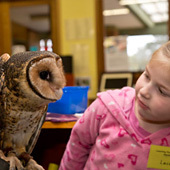 Most kids today know almost nothing about nature and wildlife conservation, but they should. The future of Australia’s wildlife and many of the regional ecosystems are constantly being encroached upon by ever-increasing land development, often times without any consideration for the wildlife that lives there. For this reason, the only hope for a better future for children today is to educate them about wildlife conservation, introducing it to them at an early age, preferably before they become overly concerned about watching television and gaming. When that happens, children become less and less connected to nature. When is the best time to introduce wildlife conservation to children? There is no better time than when they are in pre-school and kinder. Developing and nurturing a deep appreciation for nature in young children is the best way to safeguard Australia’s wildlife and environment from excessive land development, by teaching them the importance and value of wildlife conservation. The best way to do this is through wildlife interaction education – a hands-on experience with animals during a school incursion. Black Snake Production is a wildlife conservation organization that provides a unique and effective wildlife interaction education for children that is perfect for pre-schoolers. During the presentation, children are able to observe animals up close, and are even allowed to touch and hold them, if they want? In this way, kids build an appreciation for wildlife and learn about their characteristics, the environment and habitat where the animals live. For over 10 years, Black Snake Productions has been offering this type of group wildlife interaction education with great results, in a sincere attempt to further conservation efforts that will benefit a vast array of Australia’s wildlife. Young children are the hope for the country’s wildlife, and as they grow into mature adults, their interaction with animals now will help them to develop compassionate feelings for them, hopefully, it will evoke a desire to protect them for generations to come. To learn more about the types of presentations available to schools, such as Minibeasts, Tooth and Talons, Bushland Diversity, Snake Safety, Australia’s Amazing Reptiles and Vanishing Species, please contact Black Snake Productions about availability, the size of your group, the school’s location, and receive a free quote.